Zanzibar Yacht Holidays by Zanzibar Yacht Charter. Join us onboard today. The Zanzibar Archipelago boasts some of the Indian Oceans most enchanting and beautiful islands. What better way is there to explore than from your own Luxury Power Yacht or Sailing Catamaran on one of our Zanzibar Yacht Holidays! Zanzibar is an exotic cocktail of narrow alleys, bazaars, shops, mosques, architectural history, intimate restaurants and large hotels and resorts. However it is the smaller islands of Zanzibar, of which there are 18, that offer our guests an opportunity to journey back in time. Join us onboard to experience the pristine beaches, abundant marine life and natural beauty, that is the exotic spice island of Zanzibar. If you enjoy fishing, diving, snorkelling, sailing or just the opportunity to glide through warm tropical Indian Ocean waters and relax on heavenly beaches, then our Zanzibar Yacht Holidays Charter is exactly for you! With its myriad of alleys and shops, Shangani Street offers guests the opportunity to get their shopping fix! The streets are too narrow for cars to fit, which creates a romantic and ancient feel to this culturally colourful town. Wander into the old town and see how ancient carpentry and carving techniques are still used. Visit the Palaces and Grand Colonial Houses and get a feel for Zanzibar’s long and dramatic history. The architecture is Swahili, Arab, Persian, Indian, European and Africa, forming an eclectic but attractive mix of houses and buildings. 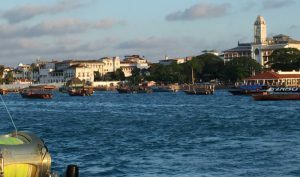 Stone Town is a designated UNESCO World Heritage Site, and rightly so since it is full of history. This buzzing little town is infectious, and well worth a visit, as a true demonstration of the variety of cultures and races which have influenced East Africa over the years. Zanzibar’s many sheltered Islands offer calm anchorages with countless coral gardens and pristine tropical beaches to explore. 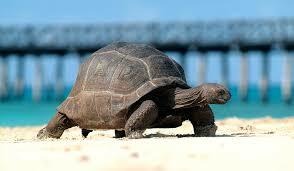 Off Stone Town lies Changuu Island (Prison Island) with its endangered Giant Tortoises, definitely worth a visit. Snorkel the fantastic reefs off Bawe Island as well as the abundant Marine Conservation Area of Chumbe Island. Giant Tortoise of Prison Island! Further south past the Fumba Peninsula lie the islands of Menai Bay. Marvel at the splendour and beauty of this area as we cruise further south from Stone Town heading towards Kizimkazi. Here our guests can take up the opportunity to go ashore and relax or stretch their legs. 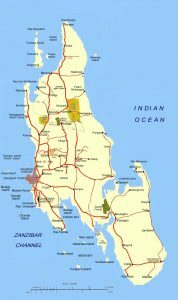 Once we have rounded the southern tip of Zanzibar Island at Kizimkazi, we will head up the east coast of Zanzibar to visit the Mnemba Island Atoll. This stunning area provides some fantastic SCUBA Diving opportunities. Furthermore, the snorkelling is world class and the reefs and drop offs provide fantastic fishing opportunities too. The visual splendour of Mnemba Island and its surrounding Atoll is in itself an experience of a lifetime! From the Mnemba Island Atoll, we continue sailing north to the bustling and vibrant beach village of Nungwi. For guests wanting to go ashore, must see attractions include a visit to the Mnarani Turtle Aquarium, a visit to the Dhow Builders, enjoy great music and sundowners at Gerry’s Bar, a cycle tour and of course a visit to the many restaurants and bars that make Nungwi the vibrant village it is. If your timing is right (Full Moon) and you are in the mood for a party, a visit to Kendwa, which lies a short sail south from Nungwi, is a must! 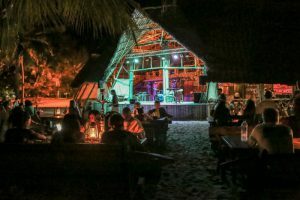 This is the home of the Kendwa Rocks Full Moon Party which starts off with Ngoma Dancers, acrobats and musicians performing on the white sandy beaches of Kendwa. Guests are welcome to join in the fun in true African Style! Party Night at Kendwa Rocks Bar! From Nungwi we sail south down the west coast of Zanzibar. Past the cultural areas of Tumbatu Island, Mkokotoni Harbour and Mangapwani. At Mangapwani a cultural visit ashore is a must to see the slave caves of Zanzibar’s dramatic past. 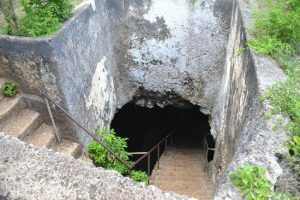 Visit the slave chambers and caves of Mangapwani. From Mangwapani, it is a relatively short sail down English Passage and back into Stone Town. You have just circumnavigated the island of Zanzibar! Here we will disembark our guests and arrange their onward transfers to either their hotel or airport. JOIN US ONBOARD FOR THE ULTIMATE ZANZIBAR YACHT HOLIDAYS!